Fire up your Tesla coil and drop some science on the non believers! The opposition is everywhere and they want to destroy you for what you believe and take your accomplishments! 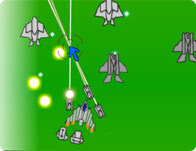 Fry them in their tracks with a fully upgradeable tower and defense options. Mouse: Aim, Fire and place weapons.